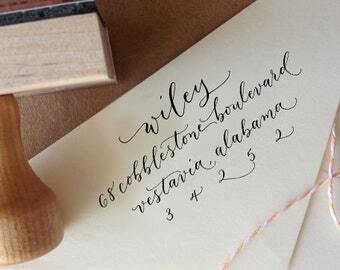 Providing original luxury suites of handwritten stationery designs and custom made calligraphy stamps! 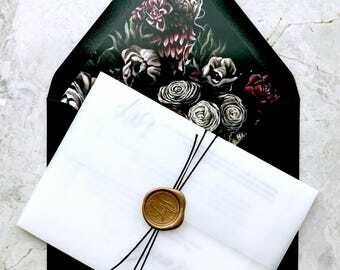 Excellence in service and quality handmade artwork is our highest priority, when creating uniquely designed pieces featuring original handwritten calligraphy by Angelique Ink for products, weddings, business identity, and more. Please convo or email to chat about details! Love the stamps. I am a repeat customer!! One before the wedding and a second after we bought a new house! As described. Love this stamp! I LOVE my stamp! Email conformation came extremely soon after placing my order double checking the spelling I wanted on the stamp. Then only a couple days later, it was out for shipment. 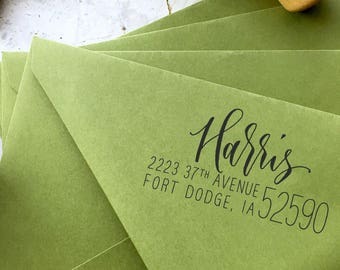 I bought the stamp for addressing my wedding invitations and I will continue to use it from now on for all of my mail. Thank you! Send more mail! 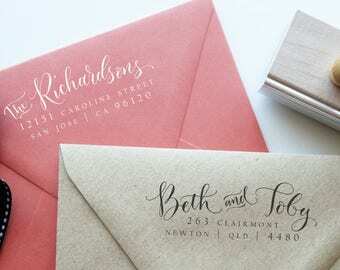 Our custom stamp collection features handwritten calligraphy in every design Gift one or grab one for yourself! Getting a head start using her new stamp for sending out those holiday cards! My name is Angelique, but you can call me Angi! Angelique, Ink is my creative studio located in SoCal with services available worldwide. I'm a calligrapher and graphic designer, specializing in modern handwritten calligraphy text illustration for social occasions like weddings, business applications like logos or ad campaigns, large-scale murals or hand drawn text for products, and sometimes personal stuff like tattoos. 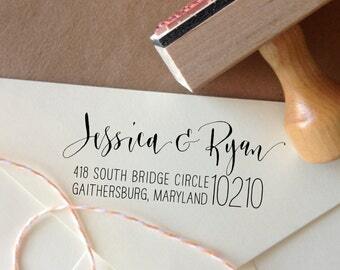 Here in my shop you can find custom products with handwritten calligraphy like return address stamps and beautiful wedding invitation suites. I love calligraphy (it's kind of "my jam") and am available for commissioned projects and artwork licensing worldwide. I'm also a calligraphy instructor, and love teaching workshops to anyone who wants to learn the art of modern calligraphy, sharing my passion for messy pen and ink with students throughout the Southern California area, and occasionally other locations in the U.S. and overseas. 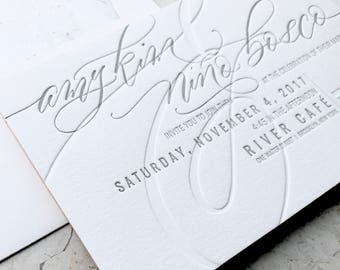 Wedding calligraphy has been a huge part of my work and I love to create beautiful detailed designs for weddings, both locally and internationally. You can see some of my work in places like Style Me Pretty, The Knot Magazine, Elizabeth Anne Designs, Wedding Chicks, Le Magnifique, Brides.com, Grey Likes Weddings, Carats & Cake, and more. For current work and happenings: keep up with me on Instagram! Happily Ever Etched (Jenny) is a local laser cutting studio with whom I work closely to make my handwritten designs into crazy-awesome laser cut and laser engraved pieces just for you! She uses the best quality materials and finest machinery. Simon has been in business since 1989. 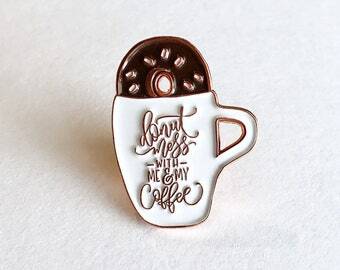 He and his team work very hard to make everything perfect for our custom made stamps, using a high quality laser engraver to cut the rubber from our unique designs! 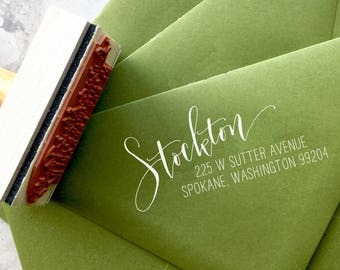 I hope you enjoy my shop and I would love to create a custom design, a calligraphy stamp, or something totally unique just for you! 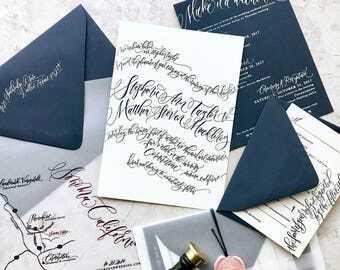 For hand calligraphy and design services, it is best to order as early as possible to ensure a spot on our calendar several months in advance. Due to the custom nature of each piece created with handwritten text design, no refunds will be made once artwork has begun for custom stamps. If there is a mistake in your order or if the item arrives damaged, please contact us within 3 days of delivery to arrange a replacement. If you would like to see a digital image of your stamp before it is made, please select the digital proof option when adding to your cart, which includes upgrade to priority mail shipping on U.S. orders. Keep your stamp out of direct sunlight, I provide a pouch for the stamp for safekeeping. It is a good idea to clean your stamp once in a while with a little water and an old toothbrush, but be careful not to soak it so the rubber doesn't begin to come off. Don't use oil based inks or harsh chemicals on the stamp. 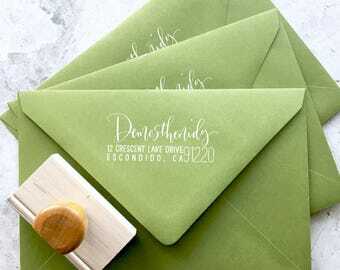 For custom stationery, handwritten calligraphy addressing, design, logo & branding work, and custom orders, convo me to discuss project details and have a reserved listing set up for the down payment. Stamp orders, prints and ready made products will be shipped via USPS or FedEx (by request) and the shipping cost will be calculated with your order depending on the weight and dimensions of the package. Tracking info is always provided. Angelique Ink is not responsible for items that are lost in the mail or returned due to an incorrect address listed on the order. *Some international orders may have import taxes/fees from the carrier due upon receipt to the shipping company. Fees vary by country and region and are not able to be calculated during checkout. Please include 20% extra of items for hand calligraphy projects. 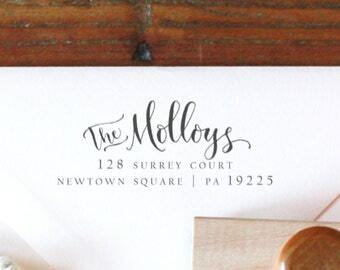 Although we try our best to avoid mistakes, it is the nature of hand-lettering to allow for human error. I will hold onto any extras when I ship back to you in case there are any corrections or additions. If you want the extras shipped back to you, please indicate this on your order. If items to be hand lettered arrive past the scheduled start time for the project, an additional charge will be incurred. We can sometimes accommodate rush orders, please inquire about your event date.